Three NMMU School of Accounting students have been selected from a nationwide search of accounting students to attend the SAICA Student Leadership Summit (SLS) in Johannesburg this weekend. Second-year Vice-Chancellor’s Scholar Danie Strydom, first-year student Maureen Pennels and BCom Honours student Olorato Mokotedi will attend the summit at the FNB Conference and Learner Centre where various workshops will be facilitated. SAICA (South African Institute of Chartered Accountants) received 157 essay submissions for the summit of which 30 essays were selected – including three by the NMMU students. 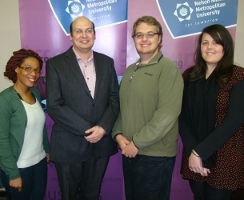 “We are very proud of these students and wish them all the best for this exciting opportunity,” says NMMU’s Director of the School of Accounting Prof Frans Prinsloo. The latest coup follows news earlier this year of NMMU’s School of Accounting excellent results in the annual South African Institute of Chartered Accountants (SAICA) initial test of competence (ITC) examination for chartered accountants. The university’s BCom Honours (Accounting) graduates of 2012 obtained a 97% pass – as compared to the national average of 86% for first time attempts. The aim of the weekend summit is to furnish students studying towards qualifying as chartered accountants [CAs (SA)] with a platform to network with business leaders holding the CA (SA) designation who have entered various spheres of business life. The idea is to emphasise the flexibility, potential and status of the qualification, thereby inspiring the students to persevere with their studies and to complete their official training requirement. The summit also creates a platform for students to network with each other. In 2011 first-year NMMU BCom accounting student Zoleka Mtila earned the top spot in the South African Institute of Chartered Accountants (SAICA) Student Leadership Summit. IMAGE: Prof Frans Prinsloo, Director of School of Accounting, congratulated (from left) Olorato Mokotedi, Danie Strydom and Maureen Pennels on being selected as one of the top 30 students to attend the SAICA Student Leadership Summit in Johannesburg.